A showcase of Auckland’s experimental and underground LGBTQIA musicians. Auckland’s experimental music scene is rich with diverse performers that have long been disconnected from the mainstream queer community due to the experimental nature of their art. We hope to showcase the best queer performers in the experimental music and noise category so that they may no longer be sidelined. Queer music is as fluid and diverse as the community it comes from. Queer and trans people have been at the forefront of so many burgeoning musical movements across history, from disco to rock & roll, to experimental harsh noise. Many of our most forward-thinking queer musicians, however, find themselves, unfortunately, sidelined from two directions – on the one hand for their identity, and on the other hand for the uncompromising nature of their art. 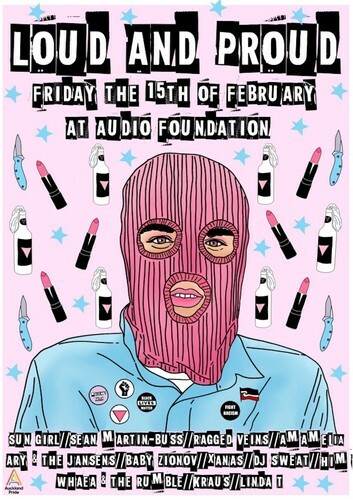 Please join us for an evening celebrating the diversity and creativity of Auckland’s queer music scene at our city’s premier location for sonic exploration – Audio Foundation.